Good things come in small packages. 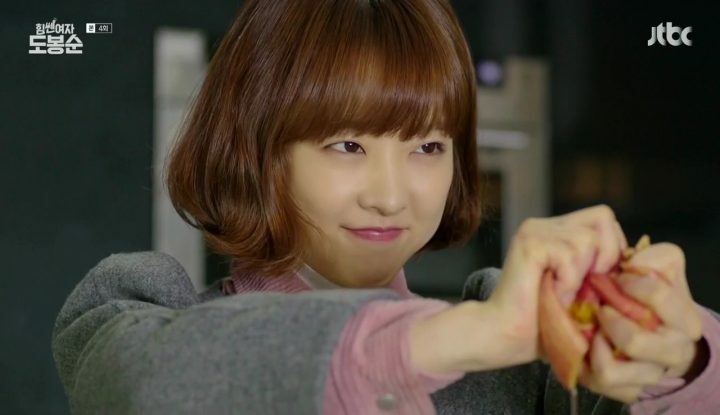 That old adage certainly holds true in Strong Woman Do Bong Soon, where our petite heroine Do Bong Soon (Park Bo Young) not only holds extraordinary strength passed down from her maternal family, but also a compassionate heart. 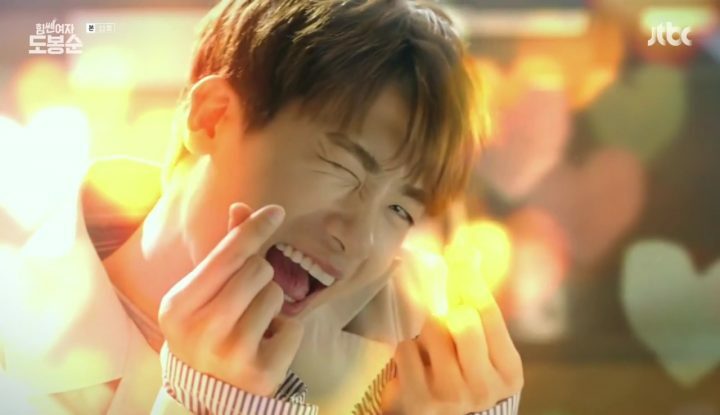 This romantic comedy drama depicts how Bong Soon’s strenuous effort in hiding her superpower and blending in as a normal person gets completely shattered when she meets chaebol and gaming company Ainsoft CEO Ahn Min Hyuk (Park Hyung Sik). Min Hyuk inadvertently witnesses Bong Soon’s special abilities and hires her on as his bodyguard in an attempt to capture the stalker who’s been threatening and blackmailing him. Bong Soon gladly accepts his offer on the condition that she transfers to the game development team afterwards to complete her dreams of making video games. Through their comedic interactions and nonsense banters, we begin to see a budding romance form. If you thought this drama is all silliness and mushiness, you couldn’t be further from the truth. Strong Woman Do Bong Soon bakes in a surprising eerie and dark plot line peppered throughout the lighthearted romance. It takes shape of a serial kidnapping case that Bong Soon’s childhood friend and long-time crush, detective In Gook Du (Ji Soo), has been chasing to solve. Bong Soon quickly gets tangled in the case as a witness after her best friend is targeted, and vows to catch the psychotic and creepy kidnapper with her own hands. The highlight is easily the remarkable on-screen chemistry between the leads. 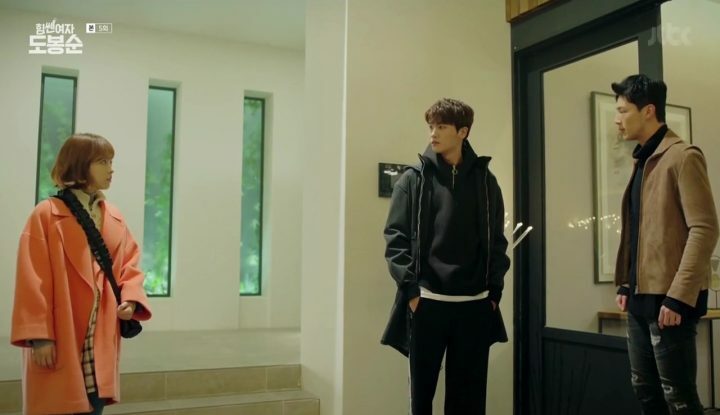 Beyond the refreshing perspective of a strong female lead character, the highlight of the drama is easily the remarkable on-screen chemistry between Park Bo Young and Park Hyung Sik. Their fantastic portrayals of Min Hyuk’s prankster yet spoiled personality combined with Bong Soon’s adorable confidence make for a dream team. Endless cute moments and hilarious interactions have me falling head over heels for this double trouble couple in no time. Even when the drama falls into total storyline halt halfway through, our lead couple manages to figuratively drag me across the abyss with their nonstoppable charms. In contrast, Gook Du’s character seems to be the epitome of humdrum bore. The serious temperament, bias towards rash decisions, and utter cluelessness towards Bong Soon’s very obvious feeling make him uninteresting to watch for the most part. Ji Soo’s delivery is robotic and awkward at best, further alienating Gook Du from any possibilities of inducing second lead syndrome. 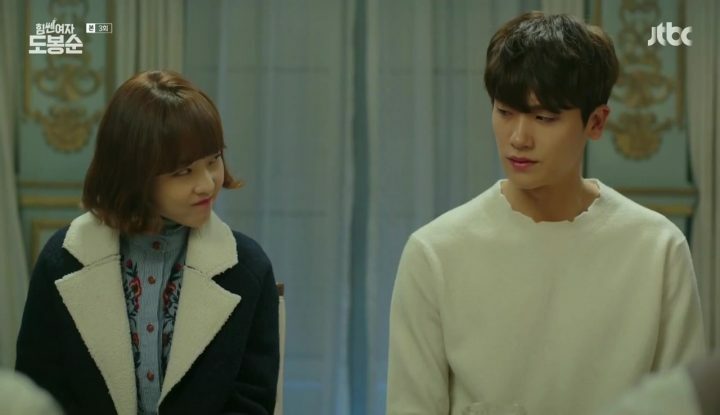 This one-dimensional character is nothing more than a tool to bring out Min Hyuk’s petty yet lovable jealousies in a love-triangle tug-and-war. Besides the three main characters, Strong Woman Do Bong Soon offers a slew of colorful, fun, and even wacky supporting characters, not all of which may have been necessary. The faceless villain is perhaps one of the most haunting antagonist that I’ve seen in a long time. 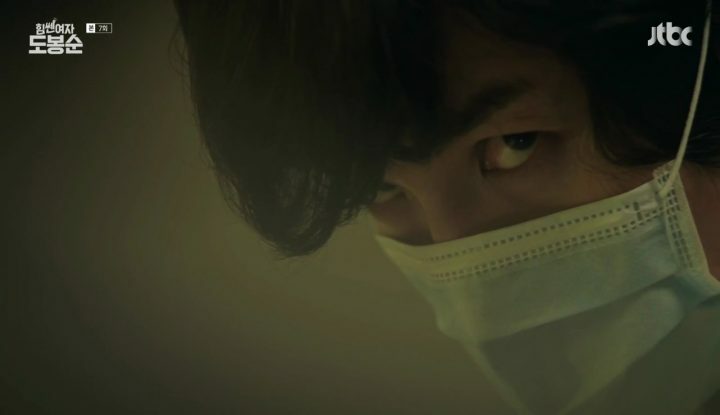 The actor perfectly conveyed the villain’s psychotic nature and merciless approach, giving me chills whenever he showed up. On the other hand, the gaggy mafia group, rowdy high school student gang, chatty neighborhood ahjummas, and theatrical Ainsoft employees all seem to have hogged a bit too much limelight, especially during the second half of the drama. Nearly entire episodes were dedicated to the mafia leader’s pursuit of peace at a temple with an offbeat monk. Sure, these comical characters were supposed to add to the flavor of the drama, but when the spices become the main ingredients of the dish, you can’t help but frown at such blatant attempts at filling up minutes and dragging out scenes. The other primary issue with the drama is the execution and pacing of its storyline. What started out as wonderfully engaging arcs — a heroine’s pursuit of mastering her true powers and solving outrageous crimes — completely fizzle out half way through, not able to live up to its strong potentials. 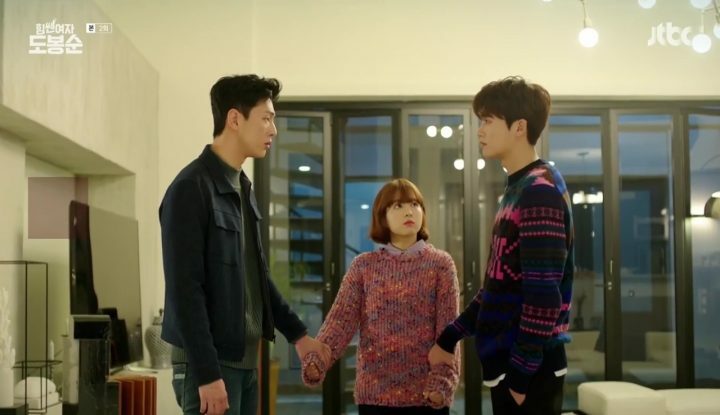 The kidnapper is completely forgotten for a few episodes while our couple is busy sorting through their relationship. And when our heroes do confront him, the plot holes around how he’s handled are a dime a dozen, not to mention the predictable nature in which he was captured. The primary issue with the drama is the execution and pacing of its storyline. On a positive note, beneath the seemingly straightforward narrative around a heroine’s quest to finding herself and true love, Strong Woman Do Bong Soon enhances its sociological values by shedding light on controversial topics such as homosexuality. In one instance, Min Hyuk was rumored to be gay, and he went along with it to prank Bong Soon, resulting in ludicrous imaginary scenarios of him advancing on Gook Du. In another case, Ainsoft’s overly flamboyant game strategy department lead is clearly portrayed to have a massive crush on Min Hyuk. The portrayal and connotation may be less than appropriate at times, but it’s nonetheless a huge step forward for such a homophobic society. All in all, if you’re looking for a relaxing rom-com with amazing romantic chemistry, colorful characters, and superpower fun, Strong Woman Do Bong Soon is not a bad choice, so long as you can sit through the less than perfect storyline in the second half of the drama. But fear not, the “Bong Bong and Min Min” couple will keep you entertained through even the bleakest plot doldrums. Yeah i agree eveything is true. I got my eyes away from those scenes with the gangster and their leader that is totally insignificant. The timing and phasing of those episodes were really off with the story.